I felt like I hadn’t played LeBlanc in awhile. We were getting into a normal game and I was fairly low on the pick order. This was the time. I needed to see if LeBlanc is still good. You be the judge if LeBlanc is back. I panicked for a minute because I didn’t know how well LeBlanc would lane against Zyra. I figured that Zyra would have great harass, better range, and wave clear. I hadn’t played this lane match-up yet, so I was a bit skeptical going in. 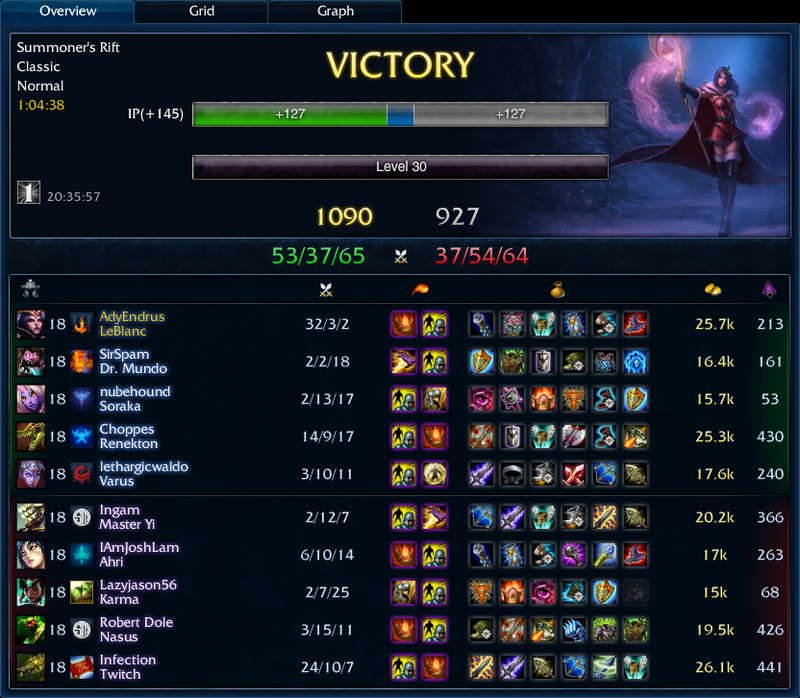 It didn’t help that I hadn’t played LeBlanc in awhile, but that was just like riding a bike. I definitely had enough misplays in this first game back as LeBlanc that I don’t want to talk about all of them. Just missed Ignites in my combos before I blinked back with Distortion, or badly timed abilities cost me a few kills, but I was picking up steam fast. I noticed that some of her level one damage was gone, so it wasn’t really worth it to trade even a single ability until level two. I was impressed with her level two burst. I came out about even on the trade with Zyra, but shortly afterwards I got a gank from Maokai and the lane started rolling. Iggie and I ruled this map with an iron fist. When Kha’Zix came to gank my lane I just killed him and took his buffs, which didn’t make life any easier for Zyra. We snowballed into a really ugly map presence where we could walk through the enemy jungle and do what we liked as we were up double in kills. After that game ended we definitely wanted to do another, so that’s getting coupled right into this post. I just had a great LeBlanc game, so why not try it again? We were doing draft pick again and I saw the other team pick Ahri and knew that I could beat Ahri in mid as LeBlanc. What I didn’t realize was that Ahri was going to help her Twitch get first blood and then pick me up as second blood shortly afterwards. I lost my 1v1 duel with the enemy mid laner. I was definitely kicking myself. I picked LeBlanc to counter Ahri, and she had just beaten me in a direct fight. Bad LeBlanc is bad. The biggest problem in this game was the Twitch who was eating our bottom lane alive. The fact that he is Diamond I didn’t help nubehound to not get intimidated. However, he had every right to be scared because this Twitch was super scary. I opted not to get Soul Stealer, which I ended up regretting. 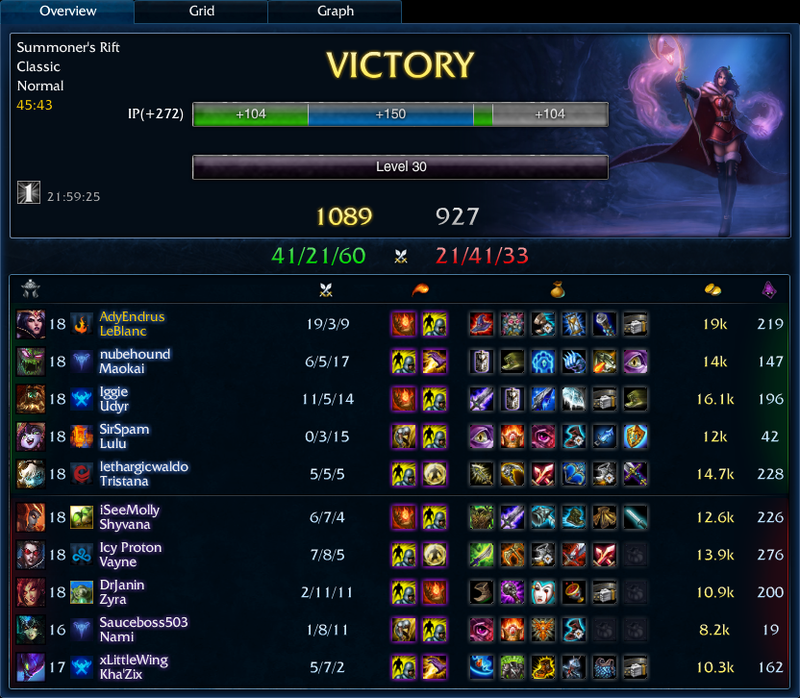 After starting 0-1-0 against a 1-0-1 Ahri I made a slight comeback. I remember Choppes and I tied at kills at 11, but then I stopped letting him have kills and just gave him some assists. Renekton actually fit in really well in this comp because if the enemy team didn’t focus me I could do some serious work, and Renekton makes enough of a mess in a team fight that he has to be respected. I would see people Flash away from Renekton and just go pick up an easy kill that couldn’t juke. I made Twitch’s head spin a couple of times when I would catch him and just evaporate him off the map. Two different times I had to hit him with a blind snare to finish him off when he had used stealth. I had a very near-death experience, but luckily I caught some footage of it. Just enjoy how many summoners and abilities were used to make sure that I die! That game definitely went longer than we ever wanted it to. We eventually sealed the win. I did my best to prevent Choppes from getting any more kills.